The Typalyzer website gives an instant and fun psychological profile of any blog based on the language used. Asked about Language Log, it says we're "scientists". It's true! It's true! Although we are "intellectually curious and daring", we "might be pshysically hesitant to try new things." I admit it. I'm so pshysically challenged that I can't even pronounce it. Further, we "tend to be so abstract and theoretical in [our] communication [we] often have a problem communcating [our] visions to other people and need to learn patience and use conrete examples." Yes, also true. Communcating has never been our strong point. Note to self: more conrete. That's why my brain hurts. [Below the fold, a note for the curious on how the Typalyzer website works. Speaking of brain un-science: gregmankiw.blogspot.com, blog of economist Greg Mankiw, steered readers to a site that claims to analyze your blog and tell you "what parts of the brain … were dominant during writing" — I think it's a crockus. There's even a little graph superimposed on a brain that is supposed to show this. One example: the analysis found that "You Don't Say" from John McIntire was not in English or Swedish, so it couldn't analyze it. Sorry I thought I was posting on an older post. You are way ahead of me. But the thing about John McIntire is still funny. This does look like a(n amusing) load of crockus, but to be fair, Professor Beaver, I don't think they could possibly intend their brain picture to be taken literally. It just looks like a background image for a spiffy graphic indicating which of the eight "types" the blog's authors fall into. The strongest claim the site seems to make is that these eight types correspond to different parts of the brain (which are not necessarily the ones indicated by the sectors of the image). On a side note, I wonder why Myers-Briggs typology is so widespread — not just in popular contexts, but in the business world, for example, where one might expect its users to have had some training in organizational psychology and thus be dubious of its usefulness. The original Jungian parameters were unscientific and MB inventories are essentially unfalsifiable. It's a psychometrician's nightmare! For any of youwho don't already know this, Myers-Briggs Type Indicator is a method for locating individuals in a four-dimensional pseudo-scientific theory of personality. You can read about its psychometric properties here. If you think of it as astrology in psychological disguise, you won't go too far wrong. As for the brain image behind the MBTI chart in the cited image, that's clearly an attempt to engage "the seductive allure of neuroscience explanation" — it's not just someone's theory of personality, it's In The Brain! I'm so pshysically challenged that I can't even pronounce it. Another (briefly) amusing analysis: literature expert o'Faust. Testing it, I pasted the two paragraphs of Mark Liberman's above comment into the text box: the Literature Expert told me that his writing bore a 40% similarity to Friedrich Wilhelm Nietzsche. Noticing that a space was missing between two small words in the first sentence ("youwho"), I made the correction and re-submitted. Now Dr. Liberman comment was only 39% like a comment Nietzsche might have made. What I found interesting is how quickly it returned a result. It must be only looking at the front page, not always the best way to judge the long-term oeuvre of a blogger. A reference to "Barnum statements" and the rhetoric of "cold reading" is also in order. According to Typealyzer, I'm less practical than LL and more arrogant. I have to admit, I didn't even see the little graphic of the brain behind the axes of the graph until this post pointed it out to me. I'd like to see the people behind this disclose some specifics behind their methods… specifically, I want to know the extent to which they hand-classified the corpus they used as their training data a priori, or if the sorting evaluation was rule-bound somehow. My hunch is that there has to be some pre-classification of the corpus going on, or some other form of human-driven reinforcement. All the same, I was initially enthusiastic about the tool and still am – not because it tells us a lick about personality or the brain (it doesn't, duh), but because it could tell us about the preconceptions we may have about style/voice. Although it's founded on a fudgy Myers-Briggs typology, a lot of people do intuitively represent things in terms of Jungian archetypes or thinking/feeling polarities, and if a machine can replicate that representation and produce familiar results, it's still of some value. I also somehow doubt it's based on lexicon and word counts alone… sooner or later, a project like this has to account for syntax. What it needs is a "rate this assessment" button so human feedback can train the system with each new input text sample. Again, it's fudgy, but it would be neat. One paragraph, typed at random off the top of my head, gave me a 15% resemblance to Edgar Rice Burroughs. A second paragraph increased the resemblance to 17%. Was that it? Was I doomed to a slight, but ever-increasing, resemblance to a classic pulp adventure writer? No. A third paragraph in the same vein gave me an 11% resemblance to Goethe. What a difference a paragraph makes! I'm not about to defend the Typalyzer, but both Myers-Briggs and astrology have valid uses that are not obvious to people trying to shoehorn them into the world of scientific disciplines. Yes, it's true. When you take the little Myers-Briggs quiz and get assigned your four-letter MB score, you are offered a little blurb that describes you more or less correctly, partly through vagueness, partly because we contain multitudes, partly because the quiz does measure something. It will say that you are like 2% or 4% of the population, and that the rest of humanity sort into other slots. The point isn't to make you feel smug about your slot, it's to quantify that most other people aren't like you, but not because there's something wrong with them. They use this in business to encourage people to communicate better with people who are different. Does it matter if the methods aren't rigorous? No, because everybody ends up in some slot, and then finds most other people in the group in other slots. Astrology is very similar, but even more random. Does it actually matter if you're an Aquarius or Libra? Everybody gets some sign. Some days you're told to get out of the house, or spend money, or meet new people, and other days to do stay in, or scrimp, or visit old friends. Everybody gets told something different every day, but not everybody gets told to do the same thing at the same time. It's a tool to keep people out of ruts. Lots of people really need this service, and need to believe a load of mumbo-jumbo about it before they can use it. The function of the I Ching is left as an exercise for the reader. 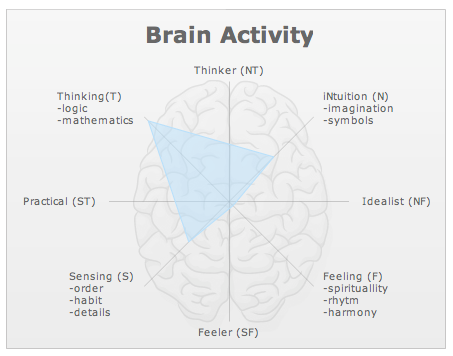 (b) someone who writes "Brain Activity" in big letters above a picture of a brain with a big shaded polygon on it, a list of stereotypically left brain categories on the left of the brain picture, and a list of stereotypically right brain categories are on the right, and who doesn't intend the brain picture to be taken literally? Maybe today's pre-schoolers are being fed a lot of fish oil? @dib: Yes, I noted the fatuous left/right distinction, and I am quite inclined to assign as little brain activity to the makers of the site as possible! The Blog Readability Test could be taken the other way: to say one needs to be a genius to read it would imply (to some) that it is lacking in "readability." Not to criticize Language Log though, its "score" is likely due to its technical nature–stuff us amateurs just don't quite get (Blog Readability Test included, apparently). Nathan Myers: The main difference between the two, AFAIK, is that if you read a random horoscope it describes you about as well as your own, but if you read a random MBTI type description you think "I know people like that, but I'm not one of them". IIRC people asked "which of these describes you best" pick their own MBTI description (with the name of the "type" removed) out of a list with a success rate better than chance, which you certainly can't do with astrology. MBTI also has test-retest correlation proving that it is indeed measuring something. So just because media discussions of MBTI contain large balls of feathers does not necessarily mean that it's all pseudoscience. Chris: MBTI also has test-retest correlation proving that it is indeed measuring something. …there are a number of psychometric limitations pertaining to the reliability and validity of the MBTI, which raise concerns about its use by practitioners. In view of these serious limitations, routine use of the MBTI is not recommended, and psychologists should be cautious as to its likely misuse in various organisational and occupational settings. But this seems to be exactly what most practitioners who use the test (e.g. "in organisational and occupational settings") do. I've been given various forms of MBTI three times — at corporate retreats and the like — and was always given a four-letter code (a different one each time), not a vector of numbers. And this dichotomous classification is often justified by proponents of MBTI on theoretical (e.g. Jungian) grounds, as (at least implicitly) in the case of the Typalyzer. Mark: I have taken various MBTI quizzes, and I always come up as ENTP or INTP. I have seen assertions that the more "balanced" you are, the less repeatable your results will be. On that risible diagram in the original posting, that would place you near the center, which they interpret as a desirable condition, indicating versatility. Most of the rest of us languish in the hinterlands, doomed to specialize. If you don't feel so well balanced, it may be that, like my wife, you just get caught up in analyzing the wording of the questions, washing out their meaning and answering them more or less randomly, washing out the signal with noise. For those of us who find the results very repeatable, the question is not whether it measures anything, but what the measurements can be construed to mean. For typical business uses, it doesn't matter. However, my being a "P" and my major professor coming out a "J" (INTJ) reflected that I was much more comfortable with uncertainty, and less comfortable about likely being wrong than he. Recognizing this made it much easier to communicate with him. One may recognize this without MBTI, but MBTI was how I came to it in that instance.